The following appeared in the Real Estate Record and Builders' Guide, v. 58, no. 1495, November 7, 1896, p. 676, "Brooklyn Vault Light Co. The above-named company succeeded to the business formerly carried on by the Towle Vault Light Co. They manufacture vault lights, skylights and patent light work, and have executed numerous contracts for important work, embracing among others eighteen public schools, Alexander Moore & Son's new apartment houses on Central Park West and 68th street, A. H. Poillon's at 61st street and Central Park West, Charles Lowen's at Boulevard and 69th street, and the Monte Cristo on upper 7th avenue. Mr. Henry Held is proprietor, and James J. Henry manager of the company, with office and shop at No. 481 Driggs avenue, Brooklyn, containing excellent facilities for reliable and prompt work. Estimates will be gladly furnished and repair work promptly attended to. Telephone 1240 Williamsburgh." The Towle referred to was William Towle, who appeared in Lain's Brooklyn City Directory from 1886 through 1899 as pattern maker, lights and vault lights. The firm name Towle Vault Light Co. appeared only in 1897, 1898 and 1899. In 1894 the New York Times, 8 Aug. 1894, among "Newly-Incorporated Companies" listed the "Towle Vault Light Company of New-York City, to manufacture skylights and vault lights; capital, $25,000. Directors - William Towle, Frank Cox of Brooklyn, George Towle of Newark, N. J., William Rye, and David Toal of New York City." The Vault Light website, glassian.org, shows the full text and a drawing from a vault light patent secured by William Towle in 1895. Henry Held (1862-? ), who took over the business in 1896, had previously appeared in Brooklyn directories as a bookkeeper from as early in 1886. His passport application in 1908 gave his full name as Henry F. D. Held, and said that he was born 19 Sept. 1862 in Kitzingen-am-Main, Germany, that he emigrated to the U. S. aboard the S. S. Donau from Bremen 22 Oct. 1882, and that he became a naturalized citizen 2 Oct. 1889 in New York City. Henry Held appeared in the U. S. Census of 1900 living at 1015 Halsey St., Brooklyn. His occupation was "vault light manufacturer," and he lived with his wife, Marie, born France, and three daughters, ages 6 years to 9 months. He also appeared in the 1910 U. S. Census, now living at 197 Maple Ave., Queens, NY. He was still a vault light manufacturer, and now with a fourth daughter and his mother-in-law in the household. By the time of the 1920 U. S. Census Held identified himself as the president of an iron foundry and lived at 605 2nd St., Brooklyn. As the Brooklyn Vault Light Co. the business was located at 481 Driggs Ave. from 1896 to 1904, Norman Ave. corner of N. Henry St. from 1905 to 1910, 254 Monitor St. from 1911 to 1931, and 262 Monitor St. from 1932 to 1958. All of these are Brooklyn addresses. This ad from 1900 appeared in the Official Proceedings of the Workingmen's Federation of the State of New York Convention Held at Utica, N. Y. September 11-14, 1900. In 1931 the New York Times, 2 Oct. 1931, p. 46, announced the incorporation of the Hinrichs Foundry and Vault Light Co.. Proprietor was Ludwig Hinrichs (1863-?). Hinrichs apprently took over Held's Brooklyn Vault Light Co. at this time. 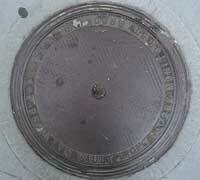 Both the Hinrichs Foundry and the Brooklyn Vault Light Co. were located at 262 Monitor St. until 1958. Ludwig Hinrichs's passport application in 1910 said that he was born 13 July 1863 in Oldenburg, Germany, that he emigrated to the U. S. from Antwerp 13 Aug. 1888, and that he became a naturalized citizen 23 Oct. 1894. He appeared in the U. S. Census of 1910 as Ludwig Henrich, age 46, born Germany, an "Iron Moulder, Foundry," living at 60 Debevoise Ave., Queens. In Polk's Brooklyn Directory for 1933-34 Hinrichs was listed as president of both the Brooklyn Vault Light Co. and the Hinrichs Foundry Vault Light Co. at 262 Monitor St.
Architects' and Builders' Magazine, January, 1911, in an article entitled "The Planning of the New York Public Library, Carrère & Hastings, Architects," states, "In the extensive vault light work over the power plant Brooklyn Vault Lights were used." Vault Lights at the Puck Building, Houston at Lafayette St., are identified as Hinrichs Foundry & Vault Light Co. The Brooklyn Vault Light entry in Sweet’s Architectural Catalogue, 1917, reads, Brooklyn Vault Light Company, 262-272 Monitor Street, Brooklyn, N. Y. 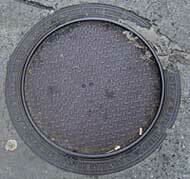 Products: "Safety Duplex Coalhole Cover with Ventilator. Reinforced Concrete All-Glass Undersurface Vault and Roof Lights. Cast Iron Vault and Roof Lights Bullseye or Prismatic Lenses. Exterior Wall Ventilators, Movable Shutters or Louvred. Illuminating Doors for Cellars and Hatchways." Illustration of the Brooklyn Vault Light safety coalchute cover and its grating and are shown in the Sweet's article. E. 29th St. NE cor 5th Ave. 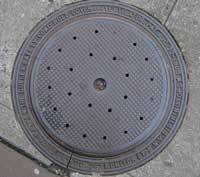 The patent information on the "Duplex Safety Coal-Hole Cover and Ventilator" seems to refer to Frederick Kees' patent No. 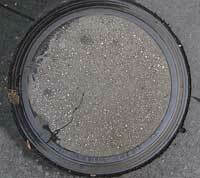 797,585 (22 Aug. 1905), where the object was "to provide a coal-hole cover that normally forms a tight or close covering over the hole in the sidewalk, but whenever desired can be easily and quickly converted into a ventilating-covering to allow the basement to be thoroughly aired." A brief notice in Architecture and Building, vol. xliv, no. 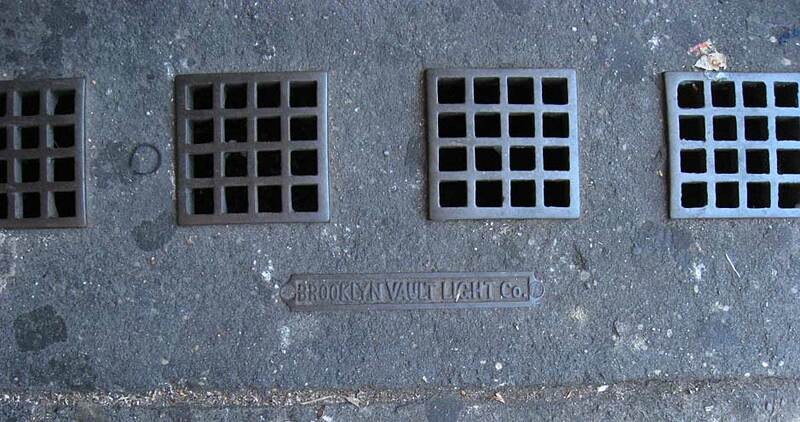 3, March, 1912, described Brooklyn Vault Light Co.'s new coal hole cover and ventilator. This advertisement for the Duplex Safety Coal-Hole Cover appeared in Architectural Record, June, 1912.